A few more people than usual may be looking for new hats but the Ottawa 67’s are up 1-0 in the Eastern Conference Semi-Finals thanks to an exciting 8-5 win over the Sudbury Wolves. Tye Felhaber made up for lost time after being held scoreless in Round 1 as the always-dangerous overager picked up a hat trick with his first three goals of the OHL playoffs. Not to be outdone, fellow overager Lucas Chiodo chimed in with three goals of his own as the experienced duo put the team on their backs in this one. 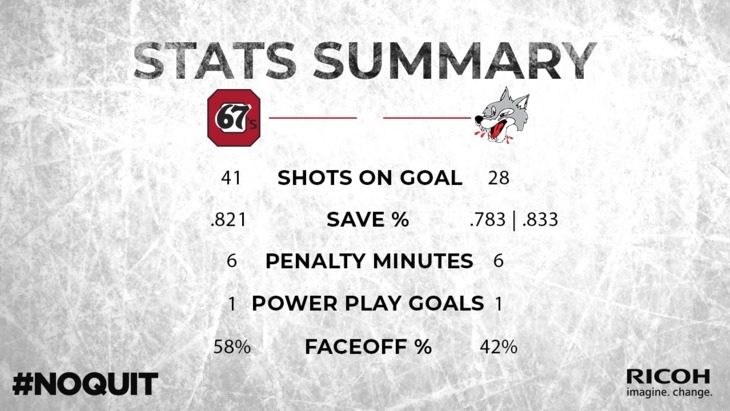 In front of a rowdy crowd of 6,441, the 67’s struck first midway through the first period before the Wolves tied it up with less than three minutes to go in the opening frame. From there on out, it was essentially Ottawa’s game. 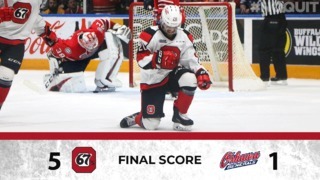 Kevin Bahl and Sam Bitten, both with their first goals of the post-season, also scored the 67’s, with Bitten’s goal chasing Sudbury goalie Ukko-Pekka Luukkonen from the Wolves goal. Kyle Maksimovich, with four assists, and Noel Hoefenmayer, with three helpers, were also firing on all cylinders in this one. 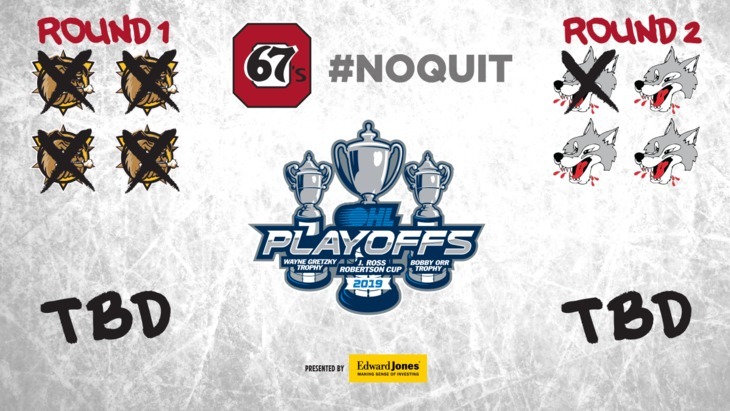 The 67’s and Wolves will go at it again on Sunday afternoon, with Game 2 of the best-of-seven series set for 2 p.m. at The Arena at TD Place. 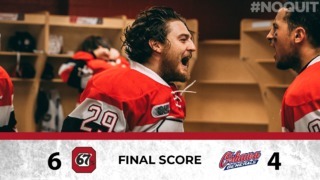 In five games this season, Friday’s game was the fourth time the 67’s have scored at least five goals and the second time they have scored eight or more. Sasha Chmelevski led the way in the face-off circle, winning 15 of 21 draws. 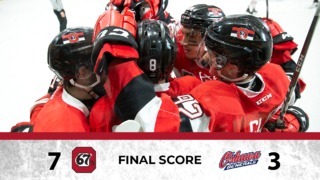 The 67’s have now won five-consecutive games to open the 2019 OHL playoffs. Each team scored once on three powerplay chances.